My recent experience of moving back to Victoria after a long absence has been an experience of coming home in several ways, writes Sister Margaret Malone. “What date is it that you are coming home?” This was a question from my brother in a phone conversation during my last weeks in Western Australia. At the time, I was preparing to return to my home state of Victoria and his question set me thinking more deeply about what it means to “come home”. Of course, I know that we can never come home to home as it was when we first left. As well as that, we are not now the same person who comes home. I have always loved the phrase of Gregory the Great and have used it many times in talks I have given. He says, “Give me the grace to see life whole and the power to speak effectively of it”. My recent experience of moving back to Victoria after a long absence, living in many different communities and working in various ministries in other states, has been an experience of coming home in several ways. This has led me to look back and really try to see my life as a whole. And of course, ageing is very much a part of this too. There are many levels of coming home. There is the literal sense of being near the home and family I was born into, and being with so many of my Good Samaritan Sisters that I have known over the years. There is remembering coming home each day wherever I lived. There is the sense of coming home to oneself, of being at home there, and of being at home with those we know and love. There is also our longing for our heavenly home. As I reflected on all these home comings, I realised just how blessed I have been. My family home was in the country and I remember the space and the beauty of the farm, the joys, and at times the struggles of the family, in the way that no doubt many families struggle at times. All of this shaped me. I also remember my first community in Canberra and how I used to always notice a line in Psalm 16 as we prayed Evening Prayer. I no longer remember what translation we were then using, but the words I have never forgotten are: “For me the measuring lines have fallen on pleasant sites”. Indeed, so true. I also remember in many other communities (though not all!) where I lived, turning in the gate after a day at school or study and being so glad to be home. In the ups and downs of various ministries there has been for the most part, a belief that I was doing something worthwhile and this has helped me experience a sense of being at home with myself. I believe this comes more from the feeling of having served others and of having related to them, rather than from a list of achievements. It is interesting to look back from my stage of ageing and to see just how one thing led to another in my life. The skills and experience I learnt in one community and ministry helped me in the next, and there is a great feeling of integration. And now in what is most likely my last home, back near where I grew up, I can certainly feel with T.S. Eliot, as he writes in “Little Gidding”. Ends and beginnings are inevitably intertwined and all that has happened to me has led me to this stage and place. There is some sense of completeness. Yet it is not complete. Another phrase of Eliot’s is apt. There is more to explore until we reach our heavenly home. As Benedict says, we must “Yearn for everlasting life with holy desire”. Even more challenging is his phrase, “It is love that impels them to pursue everlasting life”. So as I begin this last stage of my life I hope that I can deepen that yearning and that love, and that I will eventually be brought, together with all those I love, to everlasting life. As I have been reflecting on this sense of coming home, I heard a report of the number of homeless there are, those who do not have a place to come home to. The figure given was 116,000. This is very challenging and confronting and it led me to think with admiration of the many of our sisters who worked with the homeless. 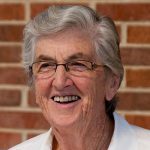 In the past there was Sister Pauline Fitz-Walter and her work in Sydney, more recently Sister Anne Dixon and all who have maintained the work at the Good Samaritan Inn in Melbourne, and now those who work with refugees who do not yet have a home and can never return to their original home. If I can’t work directly in this way, at least I hope I can be aware of the needs of those around me and be alive to the needs of the world.